This post was inspired by a research report based on a survey of 254 CIOs worldwide, as published by Experian. The survey was titled “Dawn of the Chief Data Officer (CDO)” and it investigated why chief data officers (CDOs) are in such high demand – and how their roles might evolve within large enterprises worldwide. The survey listed 10 takeaways, which I simply have to provide some slightly tongue in cheek commentary on. The survey states that roughly 90% of the respondents (mostly CIOs) expressed that data is transforming the way they do business, with 92% suggesting that CDOs are best positioned to define a data strategy and that the CDO is fast emerging as the guardian of data quality within the organisation. I would be very interested to ask those 233.68 CIOs how they have been operating up to now, without even a rudimentary data strategy in place? Sure data is getting more attention now, as it is rightfully transforming the way many organisations do business, but the strategic view of data is definitely not new. It has been around for ages – for example John Zachman already defined his famous framework in 1987 which has a distinct data management component. So, Mr CIO, my question is – what have you been doing about data management all these years? The survey slideshow notes that “fully 61% of CIOs want to see a CDO hired within the next 12 months”. It also states that roughly 47% of CIOs say their biggest barrier to success is the sheer volume of data – which can be overwhelming as businesses strive to improve their interactions with audiences. I am sure that those 154.94 CIOs want help appointed – and fast – and I can agree with the need for that, considering the statement made above. I just wonder what the approximately 79 other CIOs are going to do that do not yet have data strategies in place? Mr CIO, are you going to roll up your sleeves and get it done yourself? In fact, I actually thought data strategy has always been part of your job description? It would be very interesting to analyse the industries in which these interviewed CIOs operate. If you’re in retail or telecommunications or the internet industries, I can understand very well that you’re overwhelmed by data volumes. However, in most other industries, even if we include the unstructured interactions with customers and other interested parties, as well as all the relevant social media streams, the data volumes are actually not that huge – not by today’s standards anyway. Experian predicts that the CDO position will largely become a senior board level role by 2020, making data gathering, management, optimization and security a C-suite conversation. My view on this is that the class of CIO that can make this shift, will remain relevant and active on the board – they may even get CDOs and/or CTOs appointed to take care of the day-to-day data management as well as the infrastructure and general IT management. 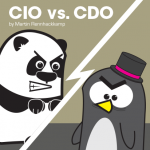 However, those CIOs who cannot make this transition will become redundant at the board, they will become conventional “IT managers” (in role anyway, if not in title) and over time they will be replaced at the board by those same CDOs they wanted appointed in such a hurry to take the heat off themselves. Experian reckons that in addition to working closing with CIOs, chief data officers will work alongside chief digital officers, directors of insights and teams of pros focused on data management and strategy. Sure the CDO, as I envision what the role means, will be working alongside or “behind” the CIO – making sure the functions such as the BI Competency Centre (which should report into the CIO) get the data they require, at the correct level of detail and correctness, in order to enable the CIO to provide the necessary information and insight to the business. Likewise, the CDO has to liaise very closely with the data stewards who should be managing the various aspects related to data and its proper management on the floor. Of course the CDO has to interface to other executives as well, such as a compliance officer, if there is one. Furthermore, I would now like to know what is the difference between a “director of insight” and a “new” digitally-minded CIO? Doesn’t the “I” of the “new” CIO stand for intelligence, insight, innovation, and so on? Experian stated that regardless of a company’s vertical market focus, its marketers are only as good as the data that underpins their plans. As a result, ensuring data quality is one important element of ensuring better interactions with the consumer. I agree with this statement – in organisations where the new CDO fulfils the role of the űber-data steward, data quality will be a major focus area. Data quality improvement not only improves customer relationships and reduces operational costs, but it also plays an important role to streamline operations, and at best it eliminates those time-consuming debates at the boardroom table about whose revenue reports actually represent the correct version of the truth. The Experian survey continues that CIOs have spent more than a decade dealing with HIPAA, Sarbanes-Oxley and other types of government regulations. 38% of CIOs see chief data officers as key hires that can help businesses cope with increasing regulations. Now I don’t blame those 96.52 CIOs for wanting to farm off the compliance reporting to the new CDOs. Compliance reporting is a pain to deal with – the results have to be correct and auditable, and have to be delivered on the correct dates, while still addressing all the other mounting business pressures for more and better information. However, I don’t think compliance reporting is a “data” issue per se. In fact, it is much more of an informational function as such – its purpose is to provide compliance information for the compliance officer or auditor who is ultimately responsible for ensuring compliance. It’s not called compliance “reporting” by accident. Experian states that while information overload is certainly a concern, CIOs also see effective data management as an underutilized opportunity. In fact, 44% of CIOs see chief data officers as the prime leaders who can help businesses to capitalize on big data. Effective data management, in my opinion isn’t necessarily an underutilised opportunity – I think it is more of a neglected responsibility. And here I agree with the first sentence, the CDO may just be the right person to get the data management disciplines under control. But as for the 111.76 CIOs who expect the CDO to become the prime leader to help capitalising on big data, I have this two-part question: So are you willing to give up your leadership role, so that the data science team, which now reports into the newly appointed CDO, can deliver all the new exciting insights derived from big data turned into profitable and innovative business outcomes? Of course some CTO-type CIOs may be willing to do that, but I still advocate that data science, big data insights and innovative use of information should fall under the C”I”O portfolio. The Experian survey furthermore reports that 41% of CIOs say chief data officers can provide a consistent approach to data driven projects, decreasing business risk along the way. Sure, if those 104.14 CIOs have too much information, innovation and insights to focus on, for example by having to innovatively drive business value from big data, I agree the CDO is the ideal role to take care of the data management aspects and get that all under control, as we briefly discussed above. The Experian report states that CIOs think investing in data quality tools can save a business about $1.5 million, but that the more optimistic CDOs say the savings from such tools can exceed $7.5 million. It’s a pity these two populations weren’t described properly, as that would give interesting insight as to where that statement originates from, and over what population that saving may be realised. However, it may just indicate that said group of CDOs have a realistic understanding as to how bad data quality in most organisations are, and how much is being wasted as a result. I would phrase it though that the saving can be achieved by better data quality measurement and management – it doesn’t always require an (additional) investment in data quality tools. I hope, of course, that the cost of said investment in data quality tools has also already been offset when reporting the more than $7.5 cost saving. Experian concludes that CIOs seem to be waking up to the value of data. They are realizing that more emphasis needs to be placed on data management and strategy to ensure that they are able to satisfy burgeoning customer expectations. If CDOs are being appointed to address this particular problem, things are moving slowly in the right direction, and we’ll soon see some proper data management and data stewardship being implemented in more and more organisations. My regular readers will know I have an issue – a pet hobby – with aspects so loosely named and terms being used so inconsistently in our industry. I have also elaborated in a previous post that I think many organisations are using the CDO role to correct previous wrongs – either in job descriptions or in executive appointments. I’m greatly concerned about those CIOs who think the CDO role was created to alleviate them from their “I” responsibilities – either they’re personally appointed in the wrong position, or their organisations have named their job roles incorrectly.